#DefendDACA protesters outside Trump Tower in New York City, August 30. Image via Getty. Despite reports from Fox News and McClatchy that claim White House sources say Trump will announce his provisional end to DACA on Friday, immigrant rights groups are pushing back on that narrative, citing insiders trying to push their own agenda from within an Administration that is divided on the issue. 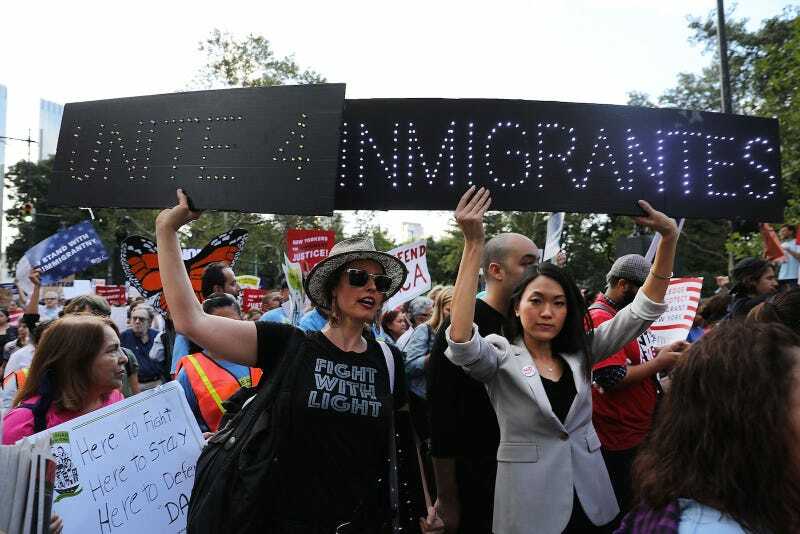 DACA, which stands for Deferred Action for Childhood Arrivals and protects undocumented people who came to the United States as children, is presently at risk because of a September 5 deadline to extend funding for the program. Today the Washington Post reported that if DACA is killed, it would cost $17.2 billion to deport the 800,000 young people who have benefited from the program since 2012. While Trump made a campaign trail promise to end DACA, factions within the White House know it would be a mistake for that very reason. In a July meeting with the Congressional Hispanic Caucus, Kelly told Democrats that he supports DACA, and that they should draft a bill in order to save it as it was unlikely that a Sessions-led DOJ would preserve it. “All the rumors on DACA would give anyone whiplash. Sarah Huckabee Sanders just denied the latest leak from Fox News and clearly, there are divisions between White House advisors who know DACA works and between the white supremacists who want to intimidate, detain and deport immigrants. “Any attempt by the President to end DACA would be a betrayal to a group of young people who are the living embodiment of American values. This administration has continuously attacked and vilified immigrants and ending DACA would be another cruel attack on our community. “The creation of DACA five years ago has allowed eligible young people the opportunity to come forward, pass a background check and pay a fee to live and work in America. DACA has been transformative to the lives of hundreds of thousands of young people and has resulted in economic gains for cities, states, and our nation as a whole. Terminating this critical program would force hundreds of thousands of young people out of the workforce, uproot their lives and the lives of their families, disrupt businesses, and devastate the economies of most states. “The President’s decision to terminate DACA would send a chilling message to our immigrant community and runs counter to our values as a nation. The vast majority of Americans, regardless of their political affiliation, overwhelmingly support giving these young people an opportunity to achieve the American Dream. I along with my Congressional colleagues and millions of Americans urge President Trump to do the right thing and protect and defend DACA.